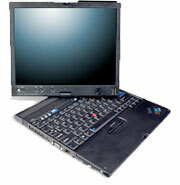 LAPTOP Magazine has reviewed the Lenovo ThinkPad X60 Tablet, the sequel to IBM/Lenovo’s ThinkPad X41 Tablet. This is a “convertible”, in that while it has all of the functionality of a Tablet PC (including running the Tablet PC Edition of Windows XP, or using the Table functionality of Microsoft Windows Vista Premium or Business editions, it also has a physical keyboard and can be configured to work as a laptop. The X60 Tablet, as mentioned, is capable of running Vista, and has a 12-inch touchscreen display and is powered by several types of Intel CPUs – from the Core Solo Low Voltage (LV) CPUs through the Core Duo Low Voltage and Core Duo regular CPUs.